McWay Falls is a year-round flowing, 80 feet high waterfall in Julia Pfeiffer Burns State Park, located approximately thirty-seven miles south of Carmel, California. The cascading water flows from McWay Creek. McWay Falls is one of only two waterfalls in the state of California that tumble directly into the ocean waters. The other to do so is Alamere Falls. The waterfall is possibly Big Sur's most well-known image. At the top of the waterfall, the outlet of McWay Creek is accessible by a trail from the road about a half mile in length. From the Highway 1 parking lot for the park, visitors can travel down the dirt path towards the ocean, reaching the overlook through a short tunnel that goes under the highway. The McWay Falls Overlook sit on the same site that was once occupied by the home of Lathrop Brown, a Congressman from New York who bought Saddle Rock Ranch from pioneer Christopher McWay in 1924. Visitors can still view what's left of the foundation of the home, the landscaping, and the Funicular railway. Displayed in nearby small building is the Pelton wheel. Visitors should look for the sign for the Waterfall Trail/Overlook by walking directly west towards Highway 1 after parking. To the south, from the overflow lot, visitors will need to walk north towards the entrance to the lot, where the sign is on the left. Down several wooden steps is a path leading to the large culvert tunnel that runs underneath Highway 1. After exiting the tunnel, the hike turns to the right and follow along a well-maintained, wide path towards the waterfall. Along the way are many vantage points, with often a photographer is at each point. The path ends after several hundred feet at a vantage point. From here, it's possible to see the Brown's old "Waterfall House" ruins up the hill in one direction, and to the other is a remarkable view up the coast. The house original intention of the house was to be turned into a museum, however, the state tore it down in 1965 after an unsuccessful attempt to save it. It's also possible to catch a glimpse of the old tramway that ran from the house to the highway. The cascading water of McWay Falls used to always directly meet the ocean water below. Unfortunately, highway reconstruction, a landslide, and a massive fire have caused enough material to fill the cove to create a sandy beach that reaches out several dozen feet. McWay Falls now only directly meets the ocean when the tide is in. The canyon, creek, and waterfall in Julia Pfeiffer Burns State Park are named for Christopher McWay, a farmer and early settler from the state of New York who came to the area around 1874. The state park is named after an early pioneer, Julia Pfeiffer Burns, a local resident who had impressed Helene Brown, as well as ran a ranch with her husband in McWay Canyon. 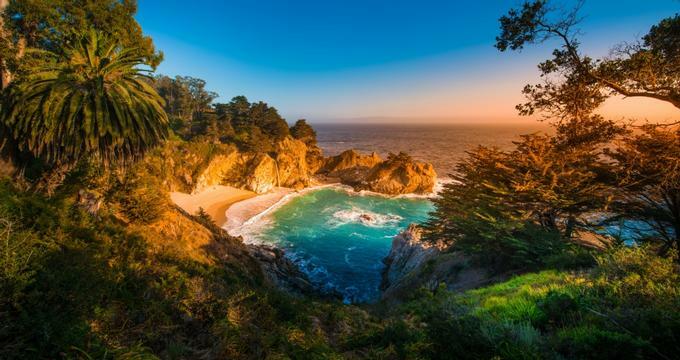 Big Sur was donated to the state of Florida in 1961 by Helene Brown with the stipulation that the park be named after Julia Pfeiffer Burns, her good friend.